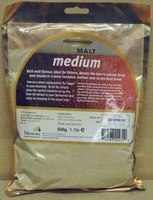 Medium Spraymalt is simply spray dried liquid malt extract and is used instead of sugar to add body to beer kits or can be used instead of liquid malt extract when brewing beer using your own recipes. It will boost the beer's natural body and results in a more rounded, mellow note to the final brew. If using instead of liquid malt in extract brewing, you should bear in mind that spraymalt is more concentrated than liquid malt extract and that you should thus use around 20% less then the amount of liquid extract specified in the recipe.